Renegade Services tracers are composed of DNA sequences that are attached to a metallic core then encapsulated within invisible particles that can be mixed with any fluid providing it with a unique fingerprint, which is easily identified and quantified with state-of-the-art bio-analytics used in medicine and forensics. The use of DNA Allows Renegade to generate as many distinct fingerprints as are needed, since unlimited DNA sequences are available. The encapsulation dramatically improves DNA stability, providing unprecedented resilience in harsh conditions. All tracer materials are non-toxic and environmentally friendly. Renegade Services DNA tracers are used to quantify and profile frac fluid, clean-up, and flow-back efficiency. They are also employed to track fluid movement through the reservoir and fracture from treatment well to nearby offset well for informed well spacing decisions. In addition, this tracer implementation in oil and gas fields allow operators to gain a complete picture of the reservoir as it develops over time, assisting in engineering and management decisions. Measurement of flow between wells using chemical tracers allow better resolve of how a field is associated. The method enables you to: Measure the presence of high permeability channels along with flow trends, prove where barriers to flow & fault lines exist, determine if cross flow is present through faults and vertical zones analysis of production well tracer we can quantify: Fluid sweep velocity, Swept Pore Volume, Sweep Efficiency, Permeability range, Miscibility of an injection gas flood, remaining oil saturation. We can perform complex multi-tracer studies to obtain a high-resolution map of a reservoir technology provides many more capabilities to understand the actual flow-back of sub-stages in multiple well completions of an entire field. DNA is Nature’s information storage system. It consists of four different bases; whose sequence encodes the genetic information. As for the genetic information, any other information can be encoded in a DNA sequence. 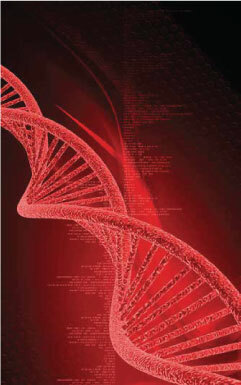 Renegade Services uses artificial DNA sequences; each sequence is distinguished from the others. The particles encapsulating the DNA are extremely small spheres less than 1 micron. Such particles are widely used in food products food additive and packaging, cosmetics, sunscreens, and pharmaceutical formulations.